Here it is, officially: the new 2018 BMW M5. 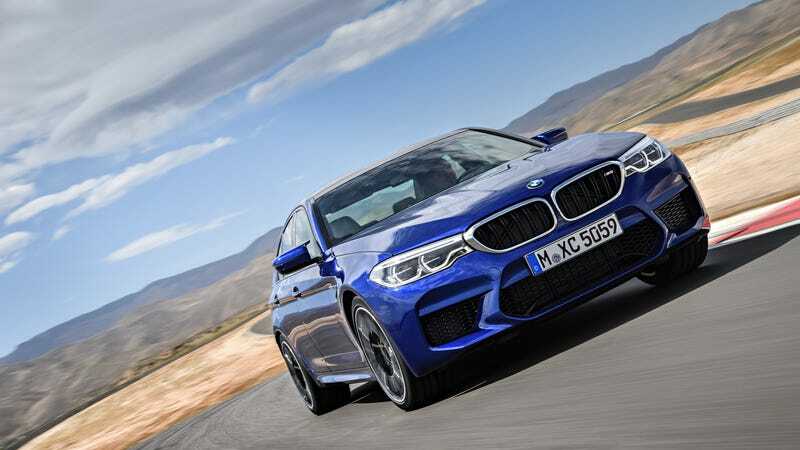 The sixth generation of the biggest and baddest M-car sedan doesn’t look terribly different from the F10 generation, but it is, and it’s more powerful and has some fancy drivetrain tech too. From the 4.4-liter twin-turbocharged V8 comes 600 horsepower and 553 lb-ft of torque. That’s up 40 horses and 53 lb-ft over the outgoing model, which uses the same motor. With the new M-specific all-wheel-drive system, imaginatively called M xDrive, the car starts up in 4WD with the traction control on. Depending on what you want to do with the car, you can change the driving modes around. This includes a RWD mode with no traction control. All that is good enough to make the M5 go from zero to 60 mph in a claimed 3.2 seconds, which makes it the quickest M car ever. Some sad news, however: an eight-speed M Steptronic transmission is the only gearbox that gets a mention in BMW’s news about the model, so the manual transmission really does die with the outgoing car as expected. The cars will be available next spring. No U.S. prices were announced yet, but will cost €117,900, which is approximately $140,000 according to today’s exchange rates. The last M5 was... good, but often lambasted for being too heavy, too big, too isolated and in general lacking the combination of sheer awesomeness and refinement that we saw with the crazy V10 M5 of the 2000s and the delightful naturally aspirated V8 M5 that came before that. Can this M5 make the M5 cool and relevant again, or is it doomed to face the sedanocalypse without a chance?